Softball Fundraising Ideas - Profitable And Fun For The Whole Team! Softball teams have uniforms, equipment, and tournaments to pay for. If you coach a traveling team, you’re racking up even more in expenses. Your fundraiser’s profit margins should maximize your team’s effort to raise money. It should also be fun for the team so they feel encouraged to participate. If you want great results, finding a softball fundraiser with a good balance of the two is essential. Many of our happy customers choose to supplement their chocolate fundraising with other youth fundraising ideas, too. There are pros and cons to each, but overall, they can be effective. This is a fun softball fundraising idea because it makes the player feel like a pro. When a player gets a hit, friends and family can donate to that player’s softball expenses. You can print simple sign-up sheets for your players. Your players can use the sheet to ask their friends and family to sign up. Each donor can choose a different amount to donate for every hit the player gets throughout the season. You don’t need to set up fancy software for your hit-a-thon. Just have players ask friends and family to donate in cash or through PayPal. Teammates can bid on different coach goofs. Essentially, the team bids on which “punishment” the coach receives. If they reach the dollar goal for goof #2, they get both #1 and #2. As the coach, maybe you’re not too fond of the idea - but take one for the team! Players, friends, and family can buy tickets to participate in a dodgeball, kickball, or disc golf tournament. Dodgeball and disc golf are cheap and accessible to everyone. A kickball tournament with BBQ is a super easy fundraising idea for softball teams. You can ask a high school for access to their gym for the dodgeball tournament. You may be surprised how many disc golf courses there are in your town. Disc golf courses are always free to play on - the only expense is buying a disc, which will cost each player around $10. A kickball tournament is easy because you already have access to a softball field. Just bring a kickball and the competition will set in. Plus, playing a different game helps every kid have a chance to build skill and confidence, as well as teamwork. 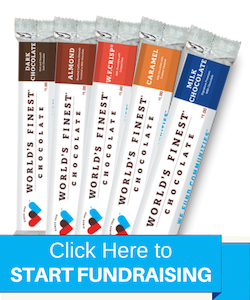 World’s Finest® Chocolate: 50% Profit Margins from Delicious Chocolate, at Just $1 or $2 a Bar! That's FUN Fundraising! You can earn up to a 50% profit margin while working with your local representative (provided free-of-charge!) Check out our fundraising calculator, or learn more about us in our free fundraising guide. It’s easy and affordable to get started - we look forward to hearing from you!